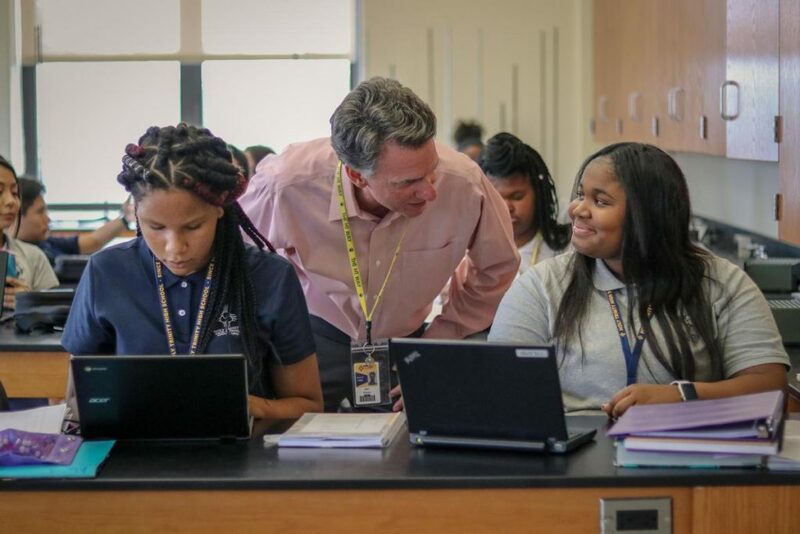 Just over a year ago, we launched HTXXII, our five-year strategic plan, with the goal to make Holy Trinity High School the model in Chicago for an academically rigorous, spiritually enriching high school that offers a valuable and affordable education. As we enter year two of our strategic plan, Holy Trinity celebrates the following accomplishments made in just the first year. with 21st-century skills. A critical component of a cutting-edge education is learning the appropriate uses of technology as a tool for creativity, communication and learning. To help accomplish this, we are proud to announce we completed the planning and secured the necessary funding to launch our 1:1 Technology Program. This year, every Holy Trinity freshman and sophomore will be issued a Chromebook touchscreen laptop, complete with a suite of Google educational products, to support and enhance their educational experience. Because of the generosity of our donors, these laptops come at no additional cost to our families. In future years, each incoming freshman class will be issued Chromebooks, so that by 2020, all students in our building will be individually equipped with a device. In addition, we’ve expanded our academic offerings to include dual credit courses through new partnerships with Benedictine University. Launching this fall, students are able to take six different classes and receive both high school and college credits. Four of the classes (AP Literature, AP Government, AP Calculus and AP Physics) will be taught at Holy Trinity by our faculty, who have been added as adjunct professors to Benedictine. American History Since 1865 will be offered via an online class with students having the opportunity to occasionally visit with the professor at Benedictine. Thirty-eight students are enrolled in the program for a combined 54 courses. In addition, we have partnered with Jesuit Virtual Learning Community (JVLC) to offer Calculus BC via an online class, with the option to add more classes in the future. Both the Benedictine and JVLC programs are allowing us to meet the academic needs of our high-performing students, ensuring every student reaches his or her full potential. In line with our goals for this year, a review team undertook a thorough evaluation and revision of Holy Trinity’s bylaws to ensure that the school is following the best practices for management and to better define the key duties of our board members. These updated policies provide the foundation to better support the efficiency and engagement of these key leaders, and ensure our board is strong and capable of leading the school for future generations. While we have always been proud of our rich heritage, we recognize that we can do even more to strengthen Holy Trinity’s identity as a Catholic, Holy Cross school. To that end, we have developed a new orientation program to introduce employees and board members to the history and charism of the Brothers of Holy Cross. We have also significantly increased the visual representations of Holy Cross throughout our building, including our newly adopted school prayer that is on display in every classroom. To strengthen relationships with other Holy Cross high schools, we held our first joint Faculty & Staff retreat in August 2017 with Notre Dame College Prep in Niles. Under Oswald Avile’s leadership as Campus Minister, we have also enhanced the role of Peer Ministers by engaging this group as leaders of underclass retreats. Our work was reaffirmed through our bi-annual Holy Cross Sponsorship Visit. The review team had 26 commendations on Holy Trinity’s Holy Cross identity and eight recommendations, which will inform our work in year two of the plan. Holy Trinity is on a growth trajectory, with a vision of enrolling 400 students by 2022. To reach that optimal size, we recognize the need to increase awareness of our school by employing a variety of marketing tactics that will generate a word-of-mouth campaign. The marketing team has introduced new, key messaging to more effectively communicate the value of a Holy Trinity education. Already, this messaging is being integrated into all of our marketing collateral. Additionally, key constituents are being trained on how to personalize their own elevator pitches explaining why they are proud to be part of the Holy Trinity family. We have also launched an enhanced social media strategy using creative new ways to share the great things happening at Holy Trinity. HTXXII calls for Holy Trinity to grow its annual fundraising program while simultaneously raising funds for critical special projects. In year one, the development team and our generous partners worked together to achieve our highest annual fundraising revenue to date, on top of funding for our bathroom renovations and 1:1 Technology. The renovation of all of our bathrooms was met with enthusiasm from all parts of our school community, emphasizing our commitment to providing students with the quality facilities they deserve. Year two is already off to a strong start with the nearly completed roof replacement, a key project to protect all other capital investments. In addition, critical tuckpointing of our 1927-constructed building and a chapel renovation will be completed in summer 2019.